I took these photos in the summer of 2003. 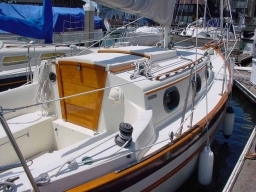 Sweetheart was moored at Brickyard Cove on Point Richmond in the San Francisco Bay. As I was returning from a sail I spotter her easy to recognize lines. As you look at the photos, bear in mind she is 20 years old.